This article was written by Heather Collier from Nottingham Trent University, published on 3rd January 2013 and has been read 5835 times. In the past I’ve been a little hard on my new home and I’d just like to point out that Spain really is not that bad. Sí, the Spanish are horrendous with money but then again so am I! All my ranting and complaining was fuelled by homesickness and now, as I approach the end of my first term here, I feel that I should make good by complimenting some of the things that Spain does well and that I love about it. While British manners remain wholly unrivalled the world over, I don’t feel that we are really all that friendly as a nation and we 100% suffer from some weird intimacy and personal space issues. However what the Spanish lack in manners (and regard for other people on public transport) they most certainly make up for by being all-round genuinely nice people. In the UK you would never say ‘hello’ to a stranger you pass on the way out of your apartment building or chat to them in the lift, but rather awkwardly avert your eyes/play on your phone/pretend that they don’t exist. Over here they’re all ‘¡HOLA!’ or ‘buenos días’ and usually when you meet people for the first time you’re expected to kiss once on either cheek, with which failure to reciprocate can cause horrendous offence. The Spanish education system with regard to languages is FANTASTIC, and many autonomous communities have bilingual schooling systems in place. I cannot speak for comunidads other than that of Madrid, or indeed for schools other than the one in which I work, but what I have seen and experienced so far has been amazing. The bilingual programme stipulates that each child in such a designated school receive 5 hours of English as a Foreign Language each week (one hour a day) in addition to at least one other subject also being taught entirely in the English language. In my school the bilingual programme currently only includes children in the primero, segundo and tercero ciclos (years 1,2 and 3) but will extend as the children move up through each grade and it ensures that they receive English instruction in all of their EFL, Science and Art classes. What’s most astonishing about this programme is how quickly the children adapt and begin to grasp the new language. The daily two hours of exposure ensure that they rapidly learn to understand or deduce most of the things we say to them, and by the second grade they have achieved near-absolute comprehension. These children can understand and say infinitely more than I was able to in French even at the age of 14, and they are only six and seven years old! The differences in skill level between children who have taken part in the programme and children who haven’t is also utterly remarkable. I teach two students privately; one of them (aged 7) is enrolled in the bilingual programme at my school and the other (aged 12) has gained English exposure solely through classes of English as Foreign Language. The two students started to learn English at the exact same age and although the 12 year old has a good six years of practise on the 7 year old, the latter’s grasp of the language is a ten-fold improvement on that of the former. Go figure. I’m just going to come out with it; the Spanish have infinitely more style than the French. My illusion of chic French women adorned in Chanel or Gautier, elegantly smoking Vogue Superslims on the banks of the Seine was shattered during my time as an au-pair this summer and, no matter how much time I spent skulking in Le Jardin du Luxembourg, it could not be repaired. France does designer and does it well, but when it comes to the High Street it just can’t cut it. You know that old stereoptype of French people wearing navy striped shirts? It’s completely justified. Enter Spain; home to fast-fashion giant Zara who can apparently roll out new stock in just two weeks compared to the 6-month industry average, and other affordability and style tying brands including Bershka and Pull & Bear. It’s also considerably more acceptable to develop and maintain your own sense of style here than it is in France where British expats hit the streets only to be dowsed in scornful glances at their shoes. Spain is famous for chorizo (chor-ee-tho NOT ‘chor-itz-oh’…please), paella, seafood, empanadas (Spanish pasties), jamón ibérico (Iberian ham), gazpacho (cold soup), potato omelette (tortilla española), rice pudding (arroz con leche), churros, Fanta Lemon (technically not Spanish but reminiscent of childhood holidays), sangria and red wine (from Rioja). The country is a gastronomical delight but is definitely not for the faint-hearted vegetarian. Take an evening stroll through the streets of central Madrid and you’ll pass half a dozen bars called ‘Museo del Jamón’ whose name literally translates as ‘Museum of Ham’. 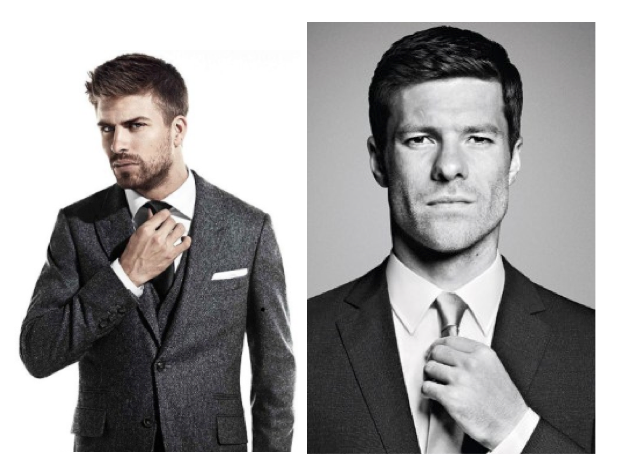 Everyone loves a good Spanish right-footer, I mean LOOK at these men! One thing I’ve noticed since arriving in Spain is that, to Spanish people, time is irrelevant. It bears no significance in their lives, nor does it influence their decisions or actions. In the beginning I found this to be highly irritating, especially coming from a culture so preoccupied by time and deadlines, but now it feels refreshing. No one rushes anywhere and heaven forbid anything is done on time! High street stores stay open until 9pm; bars close when the last person leaves and nightclubs don’t get busy until at least 1.30am (and don’t close until 6am). Take to the streets at 11pm and you’ll see a dozen wide-awake children out and about with their totally unfazed parents while their British counterparts will have been in the Land of Nod for a whole two hours already. The Spanish live for now and they especially live for the night and, save for their enormous financial worries, they’re all the happier for it. ‘The rain in Spain stays mainly in the plain.’ FALSE. It rains everywhere on the Spanish mainland, especially in those hilly northernmost regions such as Navarre and the Basque Country. The Canary Islands (off the northwest coast of the African continent) enjoy a subtropical climate where influctuating temperatures remain warm all year and almost never drop below 20 °C, and back here on the Iberian Peninsula it’s not too shabby either… for most of the year. The misconceptions that most Brits hold with regard to weather and geography in Spain are both hilarious and embarrassing. If I had a penny for every time someone has said to me ‘Oh you must be SO tanned’ or ‘Make the most of Spain, it is FREEZING here’ and even ‘When I come to visit you In Madrid can we go to the beach?’ I’d be a gazillionaire and, while I chuckle at the ignorant comments and naïve questions, I too have been guilty of such false assumptions in the not too distant past. For a significant portion of the year Spain is hot. When I first arrived in mid-September the temperatures were still pushing 30 °C and had steadily declined to a very agreeable 18°C by the turn of November. In mid-November I could still venture out in ballet flats and my leather jacket without risking hypothermia, but in the latter half of the month the temperatures began to plummet and it became wool-donning weather over the course of a single night. Fortunately I’m told that come March the weather will be warming up again and I’ll be pulling out my maxi skirts from the back of my ridiculously large wardrobe. Eight months of summer sun per year in a capital city slap bang in the middle of a country? Now THAT I love.